“Think Instagram for the eye,” said one of the developers, assistant professor of ophthalmology Robert Chang, MD. Chang, who is the senior author of the two papers, added that ophthalmology is a highly image-oriented field. “With smartphone cameras now everywhere, and a small, inexpensive attachment that helps the ancillary health-care staff to take a picture needed for an eye consultation, we should be able to lower the barrier to tele-ophthalmology,” he said. 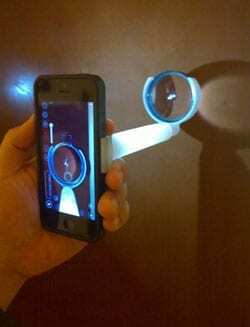 Other adapters are available to attach a smartphone to a slit lamp — a microscope with an adjustable, high-intensity light — to capture images of the front of the eye. But Myung found this process time-consuming and inconvenient, even with commercially available adapters designed for this purpose. Given the fast pace of patient care, he wanted point-and-shoot ability in seconds, not minutes, with instant upload to a secure server. More importantly, the team envisioned the device to be readily usable by any health-care practitioner, not just eye doctors. So Myung decided to bypass the slit lamp, a complicated piece of equipment. “I started entertaining the idea of a pocket-sized adapter that makes the phone do most of the heavy lifting,” he said. After numerous iterations, he found a combination of magnification and lighting elements that worked. “It took some time to figure out how to mount the lens and lighting elements to the phone in an efficient yet effective way,” said Myung, who built the prototypes with inexpensive parts purchased almost exclusively online, including plastic caps, plastic spacers, LEDs, switches, universal mounts, macrolenses and even a handful of Legos. After successfully imaging the front of the eye, he then focused on visualizing the inside lining of the back of the eye, called the retina. “Taking a photo of the retina is harder because you need to focus light through the pupil to reach inside the eye,” said Myung. To optimize the view through a dilated pupil, Myung used optics theory to determine the perfect working distance and lighting conditions for a simple adapter that connects a conventional examination lens to a phone. Myung and chief ophthalmology resident Lisa He, MD, shot hundreds of photos with various iterations of the adapter, consulting with Chang and Mark Blumenkranz, MD, retina specialist and chair of the Ophthalmology Department, until they got it right. Then Stanford mechanical engineering graduate student Alexandre Jais constructed computerized models of these “screwed-and-glued” prototypes to produce 3D-printed versions. Jais made the first of these prototypes on his own 3D printer before moving to the Stanford Product Realization Lab to manufacture higher-resolution adapters. Chief resident He is leading a clinical study grading the quality of smartphone images taken using the adapters in the Stanford Emergency Department. Medical student Vivian Lei is helping with that trial. A second study, spearheaded by resident Brian Toy, MD, will test the ability of images taken with the adapters to track eye disease in patients with diabetes. Myung and Chang have recently been awarded seed grants from the School of Medicine and the Stanford Biodesign Program to fund the production of the initial batch of adapters, currently dubbed EyeGo, for distribution and continued evaluation. The initial adapters will be available for purchase for research purposes only while the team seeks guidance from the Food and Drug Administration. “We have gotten the production cost of each type of adapter to under $90 but the goal is to make it even lower in the future,” Chang said. Recently, a team from the University of Melbourne in Australia used the two adapters on a medical mission trip to Ethiopia and told Chang they were excited about the results. April 17, 2019 - The absolute best camera on any phone CNETThe Huawei P30 Pro's photo skills rule the phone world. April 17, 2019 - TROUBLESHOOTERS: Keeping an eye on speeders in Washington HOI ABCAbout 17000 people live in the city of Washington and officers in the area are working to keep everyone safe 24/7. Chief Deputy Jeffrey Stevens told. April 17, 2019 - 20 tips and tricks for your new Samsung Galaxy S10 Popular ScienceBoost battery life, improve picture quality, launch apps quickly, take better photos and more with our top tips for the Galaxy S10. April 17, 2019 - Honor 20i Review: A Middle Range Phone Simply Irresistible gizmochinaIn a bid to tighten their grip in the smartphone market, leading handset manufacturers are diverting their focus from performance to photography. April 11, 2019 - Huawei's new P30 Pro smartphone can see 'better than human eyes' Daily HiveHuawei's new P30 series smartphones just hit the Canadian market, and they're set to lead the way for what a smartphone camera should look like.